I learned an interlocking fold from a Japanese architect who has since passed away. He was an inspiring artist. He originally showed me how to make a flower but I couldn't stop at that and made sculptures and bowl. They were shown at the Florida Craftsmen Gallery which is a statewide organization. They were also shown at other events. Origami is an art. I can make Egret, boat, flower, ship, Ninja blade and some easy things. But I am interested to make more thinks. Your black bird is looking awesome and I think it is complected to make. Now, that's what I call a zen moment. Wow! I love origami and this is amazing! Kudos to you Joyce! 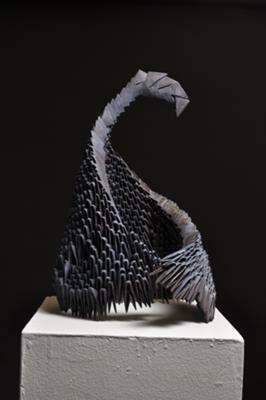 This piece is so elegant - it is like origami scuplture...I've never seen anything like it! It looks so fluid, even though it is made of paper. Beautiful! YOU ARE AMAZING, SMART AND BEAUTIFUL!! I AM SO PROUD OF YOU....THERE ISN'T ANYTHING YOU CAN'T DO. That looks soooo hard! I am an origami freak, but this is awesome!! !